September is here and fall is in the air. With the arrival of autumn comes back to school, harvest festivals, Friday night lights, the first frost, and most important of all: baking season! And while pumpkin seems to get top seasonal billing, let’s not forget about the crisp, juicy, delicious apple and all it has to offer. This amazingly delicious Caramel Apple Crumble Pie is bursting with all of those great fall spices and flavors . What’s to Love About Caramel Apple Crumble Pie? 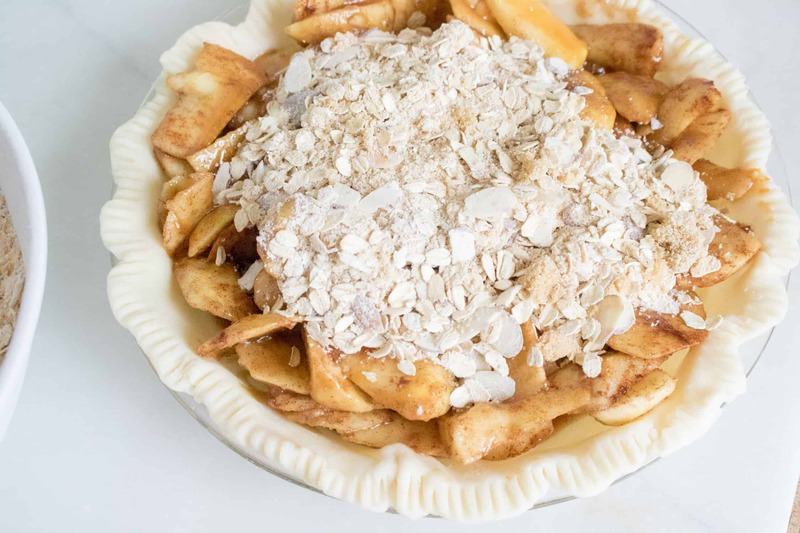 It marries together two classic, long-standing dessert favorites; apple pie and apple crumble. 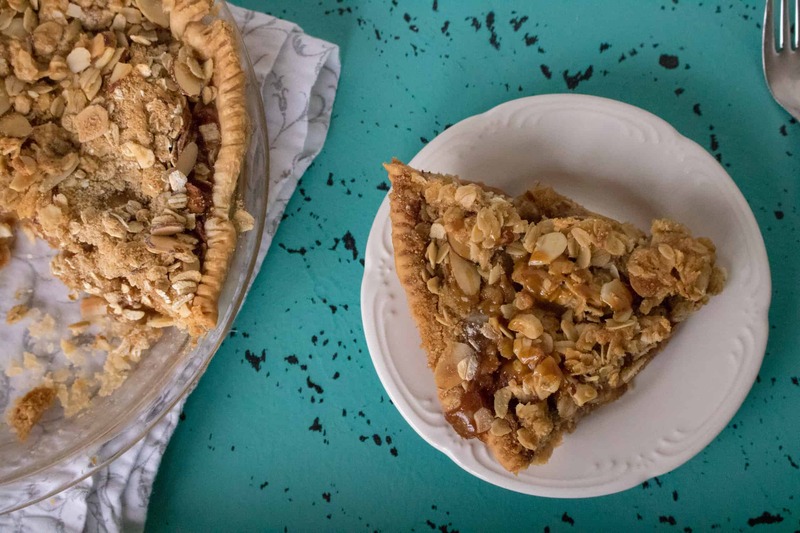 It combines the deliciousness of a flaky pie crust with the irresistible taste of oats, cinnamon, almonds, brown sugar and butter for a crumbly topping (personally, my favorite part). It gives you an additional way to enjoy juicy, crunchy apples that are so flavorful and prevalent this time of year. Sure, it’s great to slice one up and eat it “naked”, but adding apples to this amazing Caramel Apple Crumble Pie for dessert is bound to win you major culinary points. It’s a true crowd pleaser! Whip up this irresistible Caramel Apple Crumble Pie to take your next potluck or one of the many upcoming holiday celebrations. 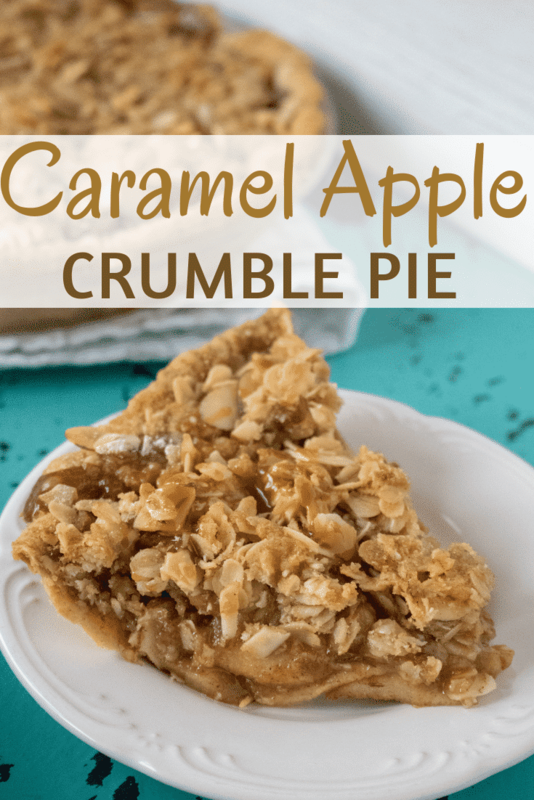 Loving the sticky, delicious caramel in the Caramel Apple Crumble Pie, but want to skip the fruit? Try this Caramel Toffee Poke Cake to get your caramel fix. Or, this Easy Raspberry Tarts recipe gives you the taste of pie in a mini individual serving. Great for showers and brunches. Need to use up some apples? Looking for comfort food or something super delicious to warm up little bellies on those cool, fall nights that are around the corner? Let your slow cooker help you whip up this Easy Slow Cooker Apple Bread Pudding. Everyone will be warm and happy after eating this treat. Step #1: Preheat an oven to 350 degrees F (175 degrees C). Step #2: Toss the apples with the lemon juice in a bowl to prevent browning. 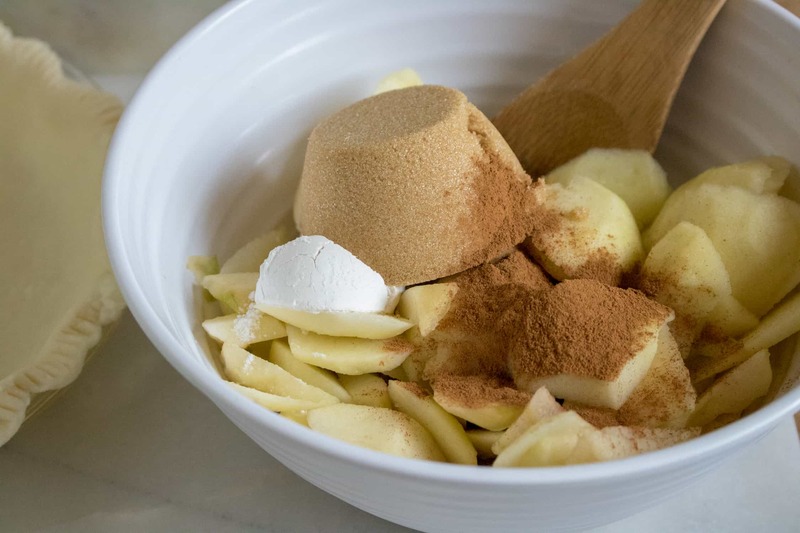 Step #3: Combine the 1 tablespoon flour, 1/2 cup brown sugar, and 2 teaspoons cinnamon; toss with the apples to coat. Step #4: Roll out the pie dough into a circle and transfer it to a 9-inch pie plate. Step #5: Trim the pastry and crimp the edge. 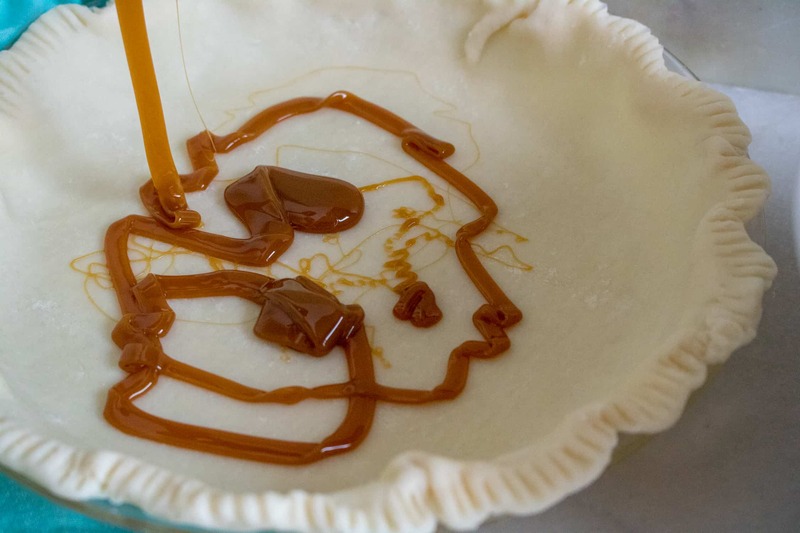 Step #6: Drizzle 1/4 cup of caramel sauce over the bottom of the pie shell. Step #7: Add the spiced apple mixture; drizzle with remaining 1/4 cup of caramel sauce. Step #8: Sprinkle the crumble topping evenly over the apples. Step #9: Bake the pie in the preheated oven for 50-60 minutes, or until the apples are tender and the crust is browned. 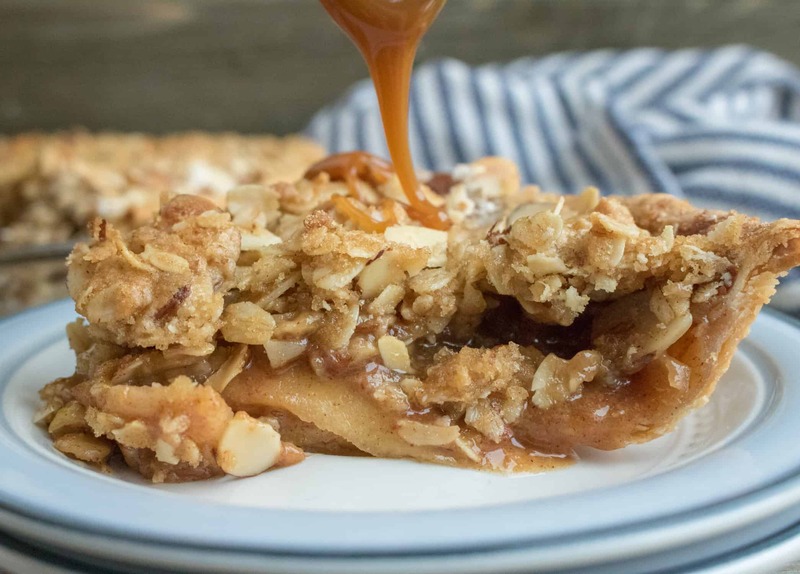 This Caramel Apple Crumble Pie is full of warm and cozy fall flavors. To make the topping: combine the oats, 1/2 cup brown sugar, 1/4 cup flour, slivered almonds, and 1/4 teaspoon cinnamon. Cut in the butter until the mixture resembles coarse crumbs; set aside. Roll out the pie dough into a circle and transfer it to a 9-inch pie plate. Trim the pastry and crimp the edge. Toss the apples with the lemon juice in a bowl to prevent browning. 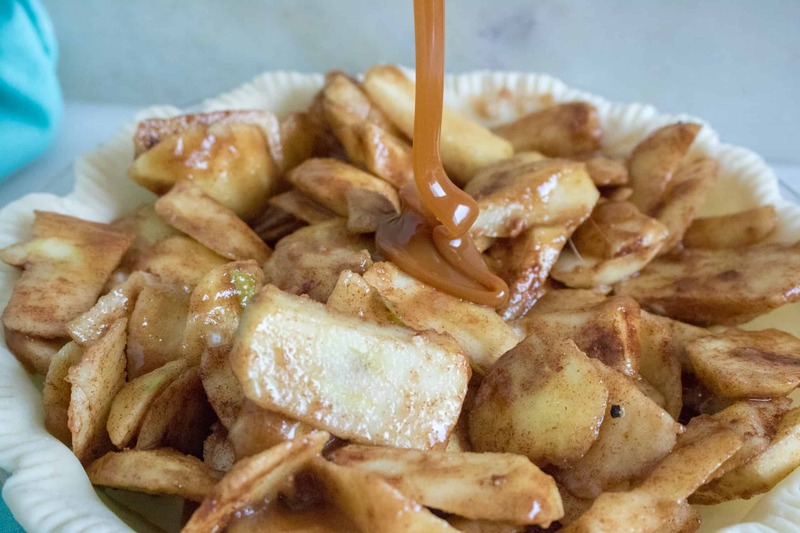 Combine the 1 tablespoon flour, 1/2 cup brown sugar, and 2 teaspoons cinnamon; toss with the apples to coat. Drizzle 1/4 cup of caramel sauce over the bottom of the pie shell. Add the spiced apple mixture; drizzle with remaining 1/4 cup of caramel sauce. Sprinkle the crumble topping evenly over the apples. Bake the pie in the preheated oven for 50-60 minutes, or until the apples are tender and the crust is browned.